Editor's note: This story has been updated to include comment from state Sen. Larry Taylor, R-Friendswood. Previously, the Senate had wanted to spend $3.7 billion to boost educator pay and $2.3 billion for property tax relief, for a total of $6 billion. Early on in the legislative session, the House proposed pumping $6.3 billion into public education — contingent on the passage of a measure overhauling the way the state funds schools — and $2.7 billion on property tax relief, for a total of $9 billion. The lower chamber gave final approval to that proposal in the wee hours Thursday with the unanimous adoption of a 2020-21 budget, contained in House Bill 1. Roughly 10 hours later, Senate Education Committee Chairman Larry Taylor — a Friendswood Republican who also serves on the Senate Finance Committee — said that a committee workgroup he led that had examined possible changes to education spending wanted to revise the upper chamber's budget proposal to include $4 billion to boost teacher and librarian pay, $2.3 billion for a school finance overhaul and $2.7 billion for property tax relief. The committee approved the changes unanimously. While the revisions put the two chambers on the same page with regard to property tax relief, they set the stage for heated negotiations over how much to spend on school finance reform and educator pay raises, which have emerged as major sticking points between the two chambers. Taylor acknowledged that fate in his announcement Thursday, saying "I’m convinced and optimistic as we continue through this legislative process that these numbers will change — they always do." "But at the end of the day, I know we’ll take very large steps" to prop up public schools and teachers "while proving meaningful tax savings." Now that the Senate has added school finance funding to its wish list, it must decide how to go about spending it. Taylor filed legislation earlier this month, Senate Bill 4, that included some school finance specifics, but it was largely incomplete. 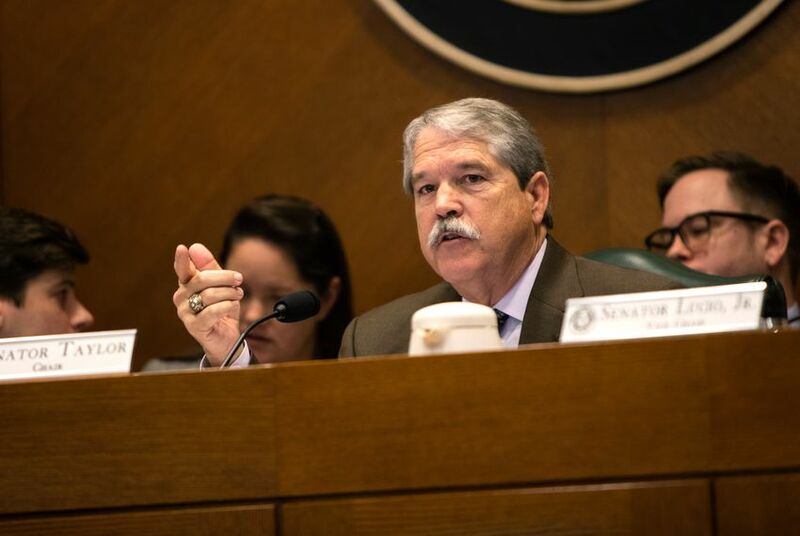 Senate leaders repeatedly indicated that SB 4 would eventually be fleshed out and cover property taxes levied by school districts. But the legislation hasn't yet been scheduled for a public hearing. And in an interview Thursday, Taylor told The Texas Tribune that SB 4 would not likely move forward and that the vehicle for the new money would be House Bill 3 — the lower chamber's school finance and property tax reform legislation, which closely tracks recommendations from a state school finance panel. The House is scheduled to vote on that legislation next Wednesday. As for the $2.7 billion the Senate wants to spend on property tax relief — that's up from $2.3 billion — Taylor said senators don't know yet how they would pay for it and are exploring a variety of funding mechanisms. The Senate's budget-writing committee had been set to vote on its spending proposal, Senate Bill 1, on Thursday. But committee chair Jane Nelson, a Flower Mound Republican, opted to leave it pending until next week after a dispute arose over a provision targeting a controversial high-speed rail project. Aliyya Swaby and Emma Platoff contributed reporting.